Multiple manufacturers made vases with ribs as the main theme of the pattern – the long vertical lines drawing your eye up, in keeping with the stems of the flowers placed in them, was apparently a great design. 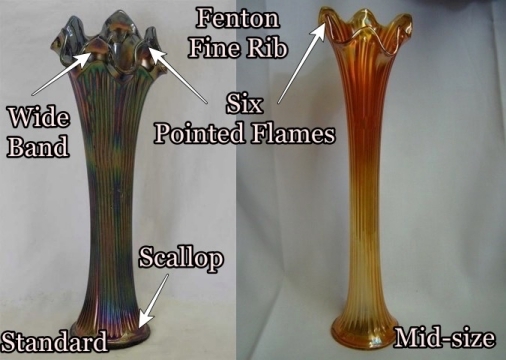 Fenton’s Fine Rib vases come in two basic sizes: Standard and Mid-Size (there is no funeral vase reported). There are also no ‘squatty’ vases reported. Base size for the standard vase is 2 ½” to 3”, and they range in height from 8” to an imposing 14” tall. They have six pointed flames on top, and they also have a blank band between the top of the ribs and the top edge of the vase. They also have definite scallops on the bottom (the ribs are enclosed in the scallops). They come in a plethora of colors. Mid-Size vases have a base size of 3 ¾”, and they were swung out when they were manufactured to between 12” and 20 ½” tall. They needed the larger base size so they wouldn’t be top-heavy and tip. The ribs go all the way to the top where there are six pointed flames. Northwood’s Fine Rib vases only come in one base size of 3 ½”, and many of them are marked with the Northwood Trademark of an underlined capital N in a circle on the base. Heights range from 5 ¾” to 11 ½”, and the top is made up of rounded flames (the ribs go all the way to the top). The vases 7” and under are called ‘squatty’ because they haven’t been swung very much. Northwood also did this pattern in the ‘ice’ colors (white, ice blue, ice green). 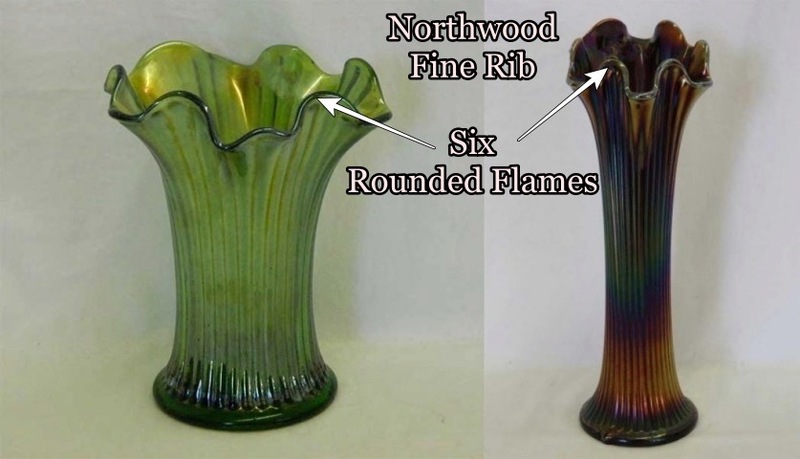 So if your vase has 6 pointed flames it could be Fenton’s Fine Rib, and if they are very rounded, it could be Northwood’s Fine Rib. Or check the base size – only Northwood has a 3 ½” base.